This ship is significant to us because it is how we met! 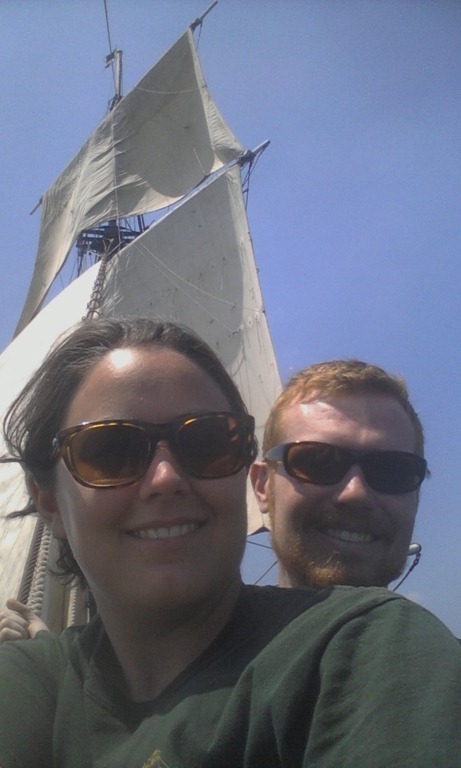 Grant was a professional crew member and Amelia was a volunteer when they crossed the Atlantic together on Bounty in 2009. Being back on the ship three years later is a fun experience. It is also a lot of work! 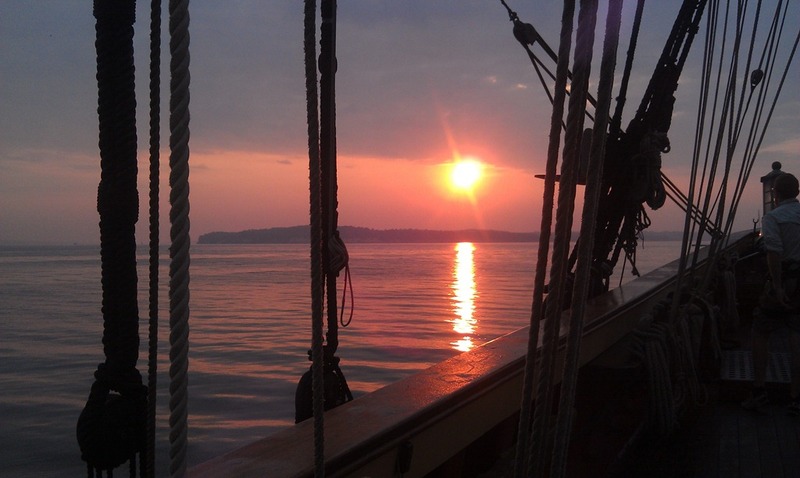 Bounty has over 18 sails to hoist, furl and many projects to attend to. Our watch the first morning was from 4-8 am, so we enjoyed the beautiful sunrise on the calm waters of the Chesapeake Bay as the anchor was hauled up and we got underway. We had spent the night near Turkey Point, where the C&D Canal and Susquehanna River part. There was a lot more current here then we expected, and moving into the Delaware River the current picked up even more. 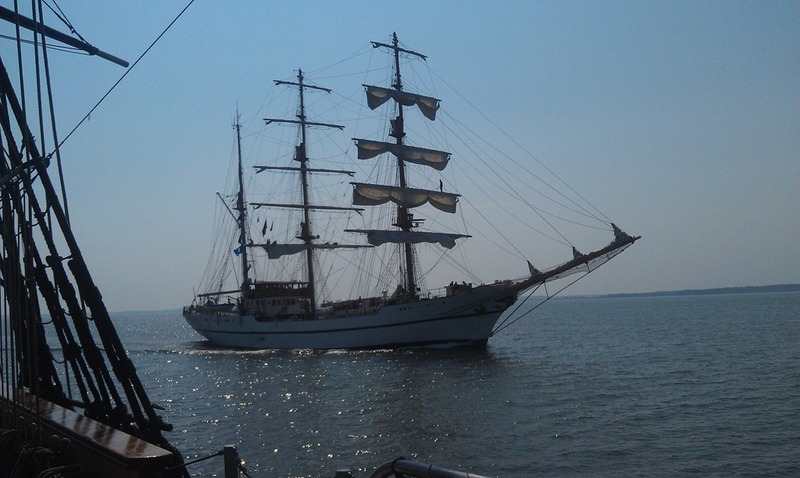 During the day, the barque rigged tall ship Guayas from Ecuador (launched in 1976) moved past us in the channel just before the entrance to the C&D Canal. Many crew members were aloft in orange work suits and waved to us. From 12-4 pm is work party! During this time the Bosun gives the off-watch crew (crew not on watch) maintenance projects to do around the ship. Today all the lines were taken off the pin rails so that the wood could be oiled. 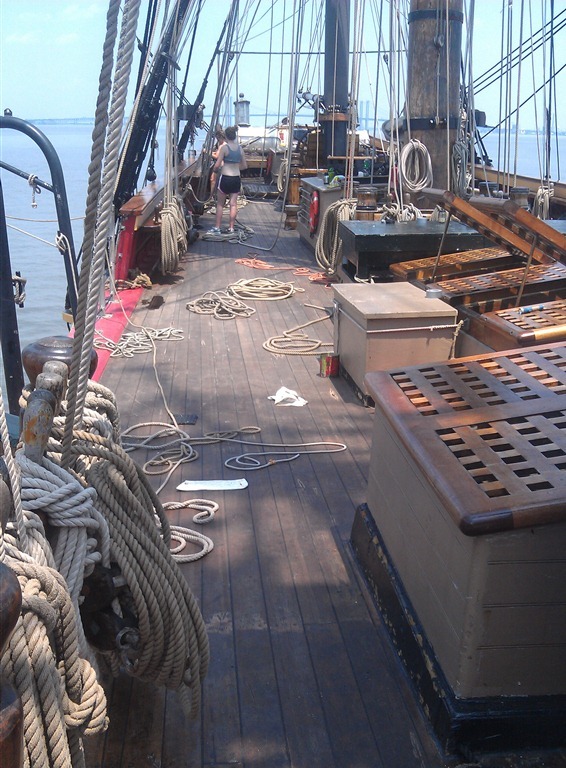 Amelia and other crew also went up to the top of the rigging to tar the shrouds while Grant hung off the side of Bounty to do some painting. We’ve tried to highlight these interesting and unique projects in our videos! Amelia stood bow watch as we came into our anchorage. Just for a fun challenge, the mates turned off the GPS and used traditional navigation (compass bearings and paper charts) to get us near shore. We were only .2 miles from our intended destination, so we did rather well. Dodging crab pots was also a challenge but we managed to avoid them all! 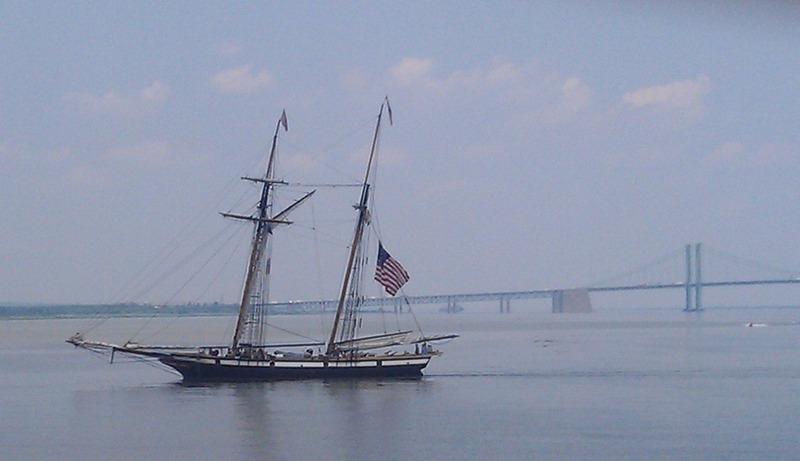 Later in the day privateer Lynx anchored near us. 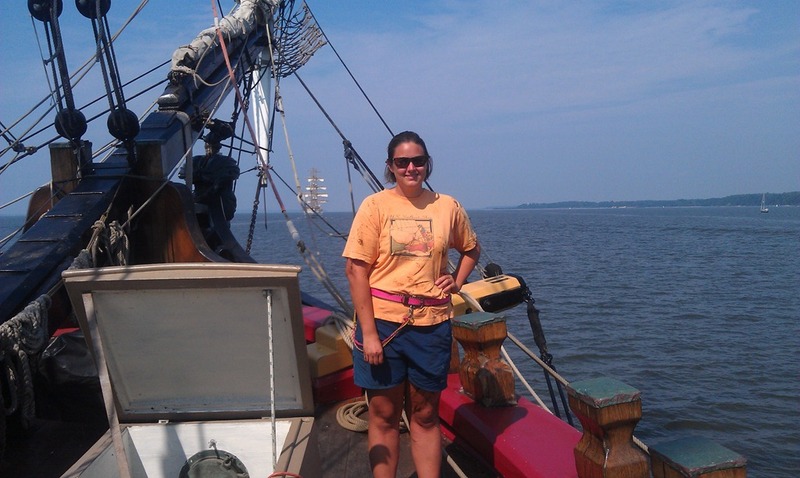 (www.privateerlynx.com) After we are at anchor Bounty goes into a rotation called “anchor watch.” One person spends each hour on watch logging our GPS position, writing down the compass bearings of three specific buildings on shore, completing a boat check and pumping the bilges. We spent the night off Newcastle, DE in anticipation of our next stop, Philadephia!